"March to Victory!" was an event held on the 1st April 2015 which saw the introduction of the Russian ST-1, German PzKpmfLfr 565(r) and American M35 experimental combat walkers. These vehicles were available in the "ST-1 Alpha Test" event and could only be used once the player had reached a certain amount of spawn points using a pre-constructed lineup of vehicles based on the nation that was chosen upon entering the event. Once the required amount was reached, the player could use one of the 3 ST-1 Variants based on their nation of choice. 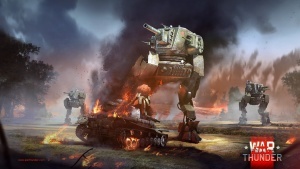 Once destroyed, the player could obtain a second once a higher amount of spawn points was reached for the second time using the regular vehicles in their lineup. Gaijin Entertainment is pleased to announce that we are implementing a new type of armoured vehicle to our military-historical online game War Thunder. The experimental model of the ST-1 Soviet tank is now in the ranks of Soviet, German and American ground forces lineups. Development of the ST-1 started even before the start of World War II. The first world war, which was also called “the trench war”, showed an inefficiency in the usual infantry breakthrough and required the creation of an absolutely new type of ground vehicle - something that could cross destroyed roads and ground torn apart from explosions. 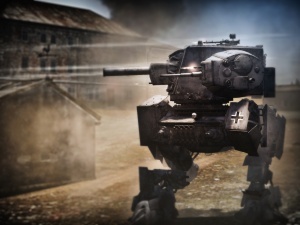 This is what the ST-1 was about - the first and the only model of a walking tank. Not only did it have an extremely high cross-country ability, the ST-1 also was almost immune to anti-tank hedgehogs and mines. Even more so, thanks to it unique looks, it would spread fear and panic in enemy infantry ranks. But at the same time, while “walking” the vehicle was highly vulnerable to different types of other weapons, even low calibre ones, which together with its high production cost forced the USSR to decline mass production of the walking tanks. 20 units were made in total, 5 of which were captured by the Germans and 3 were given to the US due to its technology exchange program. The developers of War Thunder have been collecting information from archives around the world to create the walking tank in the game. Different parts of ST-1 - some turret details, for example, were discovered in later projects of some Soviet tanks: the KV-1, the T-26 and also the T-60. If you want to read more about this unique vehicle, read our Developer's Blog here! This page was last edited on 28 January 2019, at 17:46.